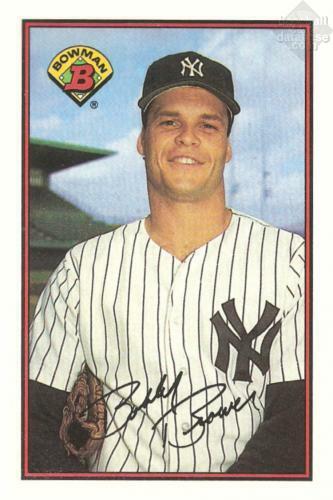 Today’s Pinstripe Birthday Celebrant is the only ex-Yankee no longer playing the game, who still thanks Scott Boras every time he gets his paycheck. Bob Brower was one of the most versatile athletes ever to graduate from Brooklyn’s James Madison High School and was the very first one to letter in four varsity sports in a single school year. Though he was only five feet eleven inches tall and weighed 185 pounds, he could hit baseballs amazingly long distances. He attended Duke University on a football scholarship but gave it up to play baseball for the Blue Devils as a walk-on. He signed with the Rangers in 1982 as an un-drafted free agent and made his big league debut with Texas, four years later. He worked his way into the team’s fourth outfielder slot by 1987 and put together his best big league season that year, hitting 14 home runs and averaging .261. When he slumped the following season, Texas traded him to the Yankees for shortstop Bobby Meacham. A month after the Yankees acquired Bower, Claudell Washington, New York’s starting center fielder in 1988, signed a free agent deal with the Angels. That meant Brower would compete for the job in his first Yankee spring training camp against two other young Yankee outfielders, Roberto Kelly and Stanley Jefferson. Brower’s playing time prospects grew even brighter when it was announced that Dave Winfield’s bad back would force him to sit out the entire ’89 season. Unfortunately for Brower, his exhibition season effort was hampered by a sore groin and a tender throwing shoulder. When the season started, he found himself on the disabled list and it was Kelly who started in center. and veteran Gary Ward in right. Dallas Green, the Yankee skipper that season, gave Brower his chance two weeks later and he seemed ready to take advantage of it. He had five hits in his first four games in pinstripes, his batting average was .385 and he had scored three runs. But the good hitting wouldn’t last and when he began to press at the plate, his defense also suffered. In a mid-May game against California, he committed two costly errors in the outfield and then got picked off first base with the Yankees trailing 4-0. Green, who by then was suffering under the full wrath of Boss Steinbrenner, expressed his displeasure with the young outfielder’s defensive lapses. What really killed Brower’s chances to make it in the Bronx, however was the team’s acquisition of Jesse Barfield during the first month of the ’89 regular season. With veteran Mel Hall already ensconced as the team’s fourth outfielder, the roster became two crowded to keep Brower and he was sent to Columbus. He spent most of the next three seasons in the minors, trying to make it back to the big leagues, but he never would. Instead, he accepted a job with a young baseball agent named Scott Boras. The two had met when Brower was a student athlete at Duke. Boras became Brower’s agent. He is now vice president of Boras Corporation. Brower shares his birthday with this former Yankee pitcher and this long-ago Yankee starting second baseman.